Dilasha Neupane crowned Miss Nepal US 2018 - Integration Through Media ....! Niteesh Basnet, TEXSAS: Dilasha Neupane, a resident of Omaha, Nebraska, was crowned Miss Nepal US 2018. She came out on top among 16 other finalists in the pageant held on Sunday (August 20) at Grand Center in Plano, Texas. She will receive $5,000 in scholarship to fund her academic career. The red velvety curtains may have closed on the stage Sunday, but the spotlight will continue to be over Neupane now. Aug 20, 2018-Dilasha Neupane, a resident of Omaha, Nebraska, was crowned Miss Nepal US 2018. Miss Nepal US 2018 contestants performs a dance routine during the event Sunday, Aug. 20 at Plano, TX. With the title of Miss Nepal US, she has become the brand ambassador for Nepal Tourism Ministry’s “Visit Nepal 2020” campaign, while representing the hyphenated identity, Nepali-American, in the international stage. “I look forward to working for the betterment of the Nepali society in the U.S. and in Nepal,” Neupane said. Neupane is a medical student with concentration in neurology. She said, with the title win, she now has a greater platform to work on her goals, which includes creating a healthier Nepal by improving the mortality rate from heart diseases and respiratory infections. She also bagged the sub-title Miss Academic Excellence during the competition. 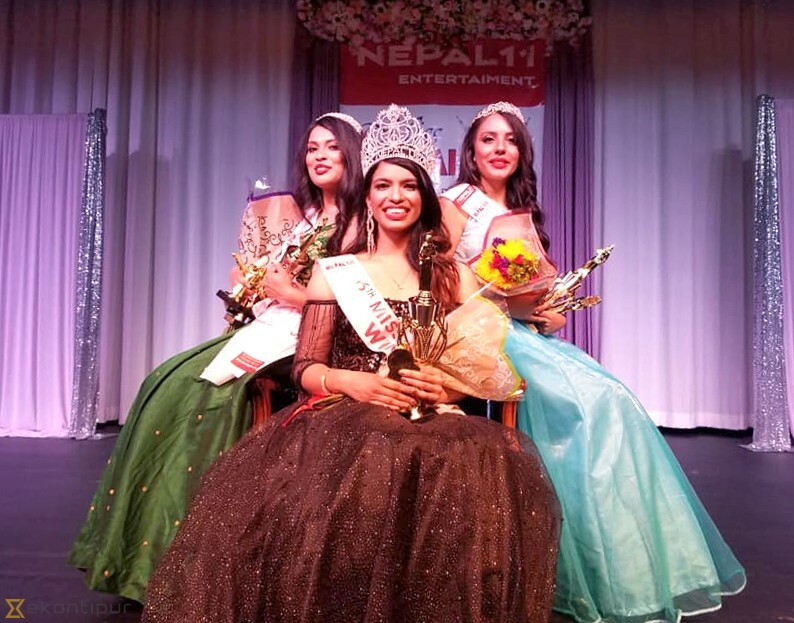 Posha Gharti Thapa, a graduate nursing student at Texas Tech University, was named Miss Nepal US first runner-up, while Colorado-raised Kriti Dhungel became the second runner-up. The Sunday’s event tail ended a week-long intensive crash course on how to win a beauty pageant. The contestants, in their late teens to mid-20s, were selected from an initial pool of hundreds of applicants. The final 17 worked on their personality and presentation skills from dawn to midnight and maintained a rigid daily schedule that included eating, resting and practicing time. The competition was fierce this year, but the girls enjoyed and lived up to the expectations, said Malina Joshi, former Miss Nepal and official trainer for Miss Nepal U.S. 2018. Joshi said she attributes that distinction to the difference in upbringing in the two countries. The American society has historically been more accepting of gender equality and individualism. The training phase for Miss Nepal typically lasts about 6 weeks, as compared to the one week given to Miss Nepal U.S. contestants. As part of the training, Joshi discussed current central issues with the contestants for help with the question-answer rounds. She also taught them the art of cat-walk among other things. Also, to the surprise of the organising team, the new form of voting for Miss Nepal U.S. Public Choice has had unprecedented success. This year, the pageant rolled out the concept of online voting for the crown of Miss Nepal U.S. Public Choice. To vote for the contestants, voters needed to pay $1 per vote. Around $20,000 worth of votes were cast. The fund raised through the votes is to be donated to Soarway Foundation, a non-profit focused on rebuilding disaster-stricken communities in Nepal. The winner of the Miss Nepal U.S. Public Choice title was Aisha Ojha, who received more than 8,000 votes. She will be appointed as the goodwill ambassador of Soarway Foundation and will oversee a charity project with the collected fund in the coming year. While, the winner of the pageant, Miss Nepal U.S. 2018, will receive $5,000 in scholarships to fund their schooling. This year’s competition marked the 6th edition to the Miss Nepal US pageant. The pageant was founded by Amit Shah, a New York City-based ophthalmology assistant by profession, in 2011. Shah said after coming to the U.S. in 2007, he found a gradual disintegration of Nepali culture amongst the youth. Shah founded Miss Nepal US with the idea of creating a platform for preserving and presenting the culture through the pageant. What he was not familiar with, however, was the logistics and economics of organising such an event. He said he had to suffer an estimated loss of $42,000 (more than Rs40 lakhs) in the first edition of the contest. Shah decided to give another shot in 2012, which still resulted in a loss of about Rs10 lakhs. He had to further cut back on dispensable costs. Then finally starting from 2013, Miss Nepal U.S. revenues broke-even with its expenses. The pageant took a hiatus for the last two years. This year, the event was held in City of Plano in Texas, a comparatively cheaper state than New York and Washington D.C. where it had been taking place since its inception. The general admission ticket to the event was priced at $50, while the VIP seats cost upwards of $100. About 150 guests attended the show on Sunday at the 300-capacity venue. 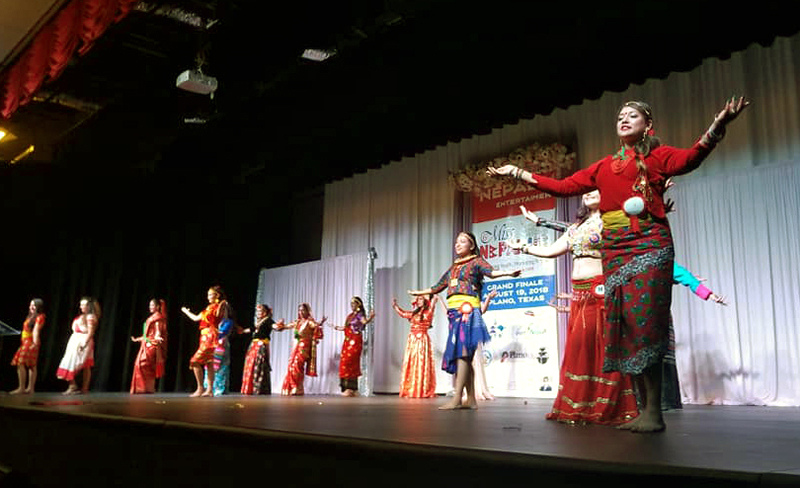 An estimated $30,000 was spent for organizing the event this year, thanks to the Texas-based Nepali community’s overwhelming support and the sponsorship deals made, said Shah.